Xanthan gum is a polysaccharide with many industrial uses, including as a common food additive. It is an effective thickening agent and stabilizer to prevent ingredients from separating. It can be produced from simple sugars using a fermentation process, and derives its name from the species of bacteria used, Xanthomonas campestris. 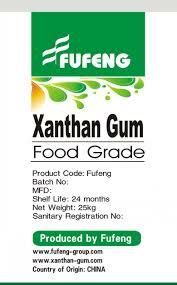 In the oil industry, xanthan gum is used in large quantities to thicken drilling mud. These fluids serve to carry the solids cut by the drilling bit back to the surface. Xanthan gum provides great “low end” rheology. When the circulation stops, the solids still remain suspended in the drilling fluid. The widespread use of horizontal drilling and the demand for good control of drilled solids has led to its expanded use. It has also been added to concrete poured underwater, to increase its viscosity and prevent washout.